It is 10:30am and I have wrestled with my computer for the 4th time. As I return to my home-based office from a coffee run (which is really just a short shuffle to the kitchen) I pass by the laundry room and realize that I really should get some laundry done at some point. Oh yea…I really need to get the tires on the Jeep checked. And a grocery run. Yep. Pretty much looks like the inertia of life is sucking up as much time as possible today. None of those items will make me money. Sure, I will be well fed with groceries, and smell good with fresh laundry, but none of these time-sucking tasks will move my note business forward. I am big on priority lists. You can go back and read 7 Action Items To Get Your Private Note Business On Track and know that in a real hurry. What if I was not big on lists to keep me on track? What if I didn’t have industrial sized Post-It Notes hanging on my office wall…constantly in my face…keeping me on track? What if you could only focus on ONE THING to better your note business? The answer is decidedly simple. I am proud that we created the best online training of its kind for the note industry. Finding Cash Flow Notes is the most revealing program when it comes to a true industry insider sharing the real ins and outs of the industry. The training has incredible information on closing notes, negotiating notes, calculating cash flow notes. You must know How to Find Notes. 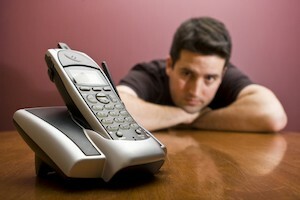 If the phone does not ring with someone wanting to sell a note, nothing else really mattered. Sure, you can whip out your HP-12C at your next cocktail party and amaze your friends with amortization schedules…but you probably will not be invited back (or at least not booked as the entertainment portion of the evening). By the way, if you are a calculator geek like me (or just want to fully understand and control you financial destiny, check out Calculating Cash Flow Notes). Getting the phone to ring is the #1 thing to focus on. Everything else, at least temporarily, can be put to the side. …do one thing to get the phone to ring. Postcard campaign, Letter Campaign, new article on your website, newspaper advertisement, contact a potential referral source. Once the phone rings, I guarantee you will find time for the other stuff.